The first public showing of a film in Yeovil was at the Assembly Rooms in Princes Street in 1896 but the Central Auction Rooms in Church Street followed in 1912, renamed the Central Hall Cinema in 1916. 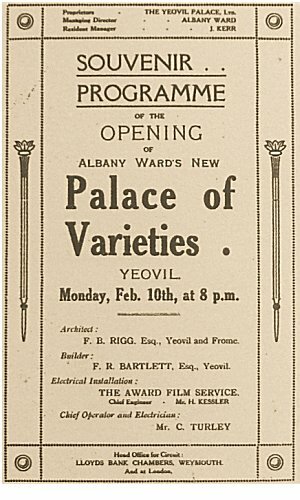 However on Monday 10 February 1913, at 8pm the Palace of Varieties, Yeovil's first purpose-built cinema, opened. It was built on the site of what was essentially slum housing known as Pashen's or Patience Court. 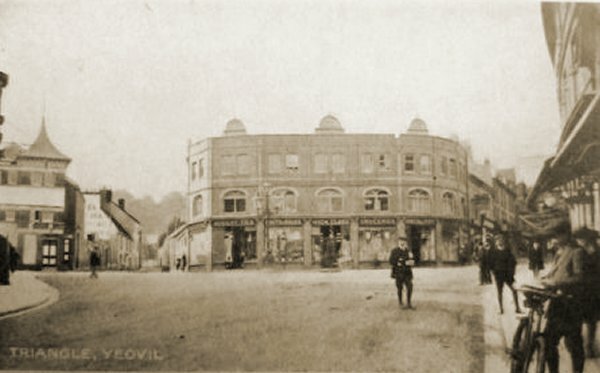 The Western Gazette reported on 14 February 1913 "On Monday evening, the new picture theatre, which has been erected in The Triangle for the Yeovil Picture Palace Ltd, was opened, and the smart little house was crowded with an audience that included a large number of the leading residents, members of the governing body, and Borough officials. 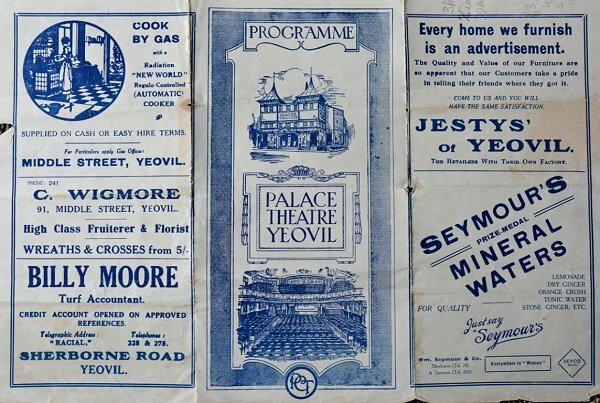 Yeovil's new cinema was the brainchild of early cinema entrepreneur Albany Ward. Hannam Edward Albany Ward (1879-1966), known as Albany Ward, was a pionéer English theatre proprietor and cinema developer, who ran one of the largest cinema circuits in Britain in the early part of the twentieth century. He was born Hannam Edward Bonnor in Stoke Newington, London, and started work in 1896 as an assistant to pionéer filmmaker Birt Acres. In 1898 he formed his own company and toured Wales and the south-west of England, becoming the first moving picture exhibitor in parts of the country. He opened his first theatre, the Empire Theatre in Oxford, in 1900, showing a mixture of films and variety acts. By 1901 he was referring to himself simply as Albany Ward, with no forenames, and described himself as "Theatrical manager". He established his first permanent theatre, in Weymouth, Dorset, in 1906 and Weymouth became his residence and main base form where he built up one of the largest circuits of cinemas in the country, owning 29 cinemas by 1914. The Palace of Varieties was designed by FB Brigg, architect of Yeovil and Frome, and built by Yeovil builder FR Bartlett. 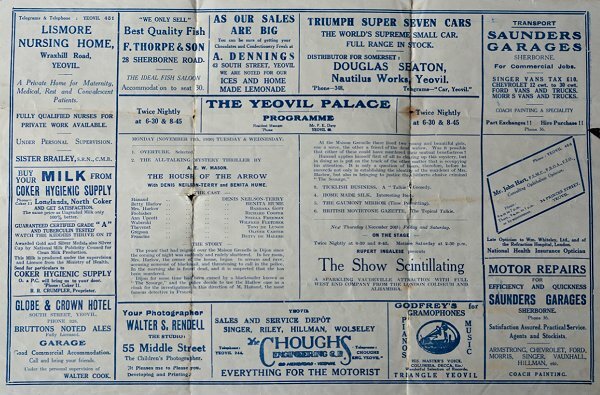 The name Palace of Varieties was not new to Yeovil and had been the name of the Assembly Rooms in Princes Street around 1905. 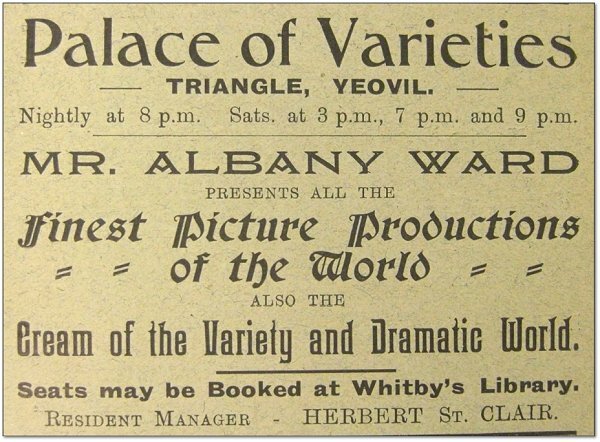 Albany Ward went out of business in 1919 and his cinema and theatre chain was sold to Provincial Cinematograph Theatres Ltd, at which time it was renamed the Yeovil Palace Theatre. In February 1929 the Provincial Cinematograph Theatres Ltd was taken over by Gaumont. 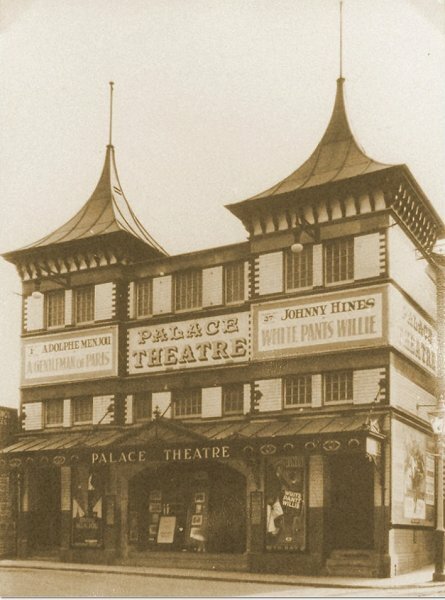 The Palace Theatre was closed and the building demolished in 1934 to be replaced by the new Gaumont Palace in 1935. The Palace of Varieties, photographed in 1913. 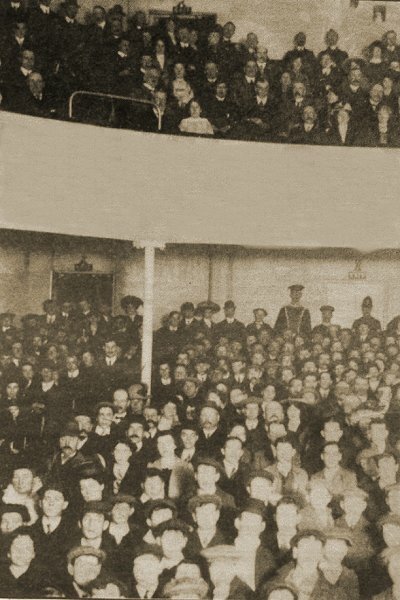 The Palace Theatre audience of 1914. Note that most of the audience are men and the ladies appear to be seated primarily in the upstairs gallery. Advertisement for Albany Ward's 'Palace of Varieties' from Whitby's Yeovil Almanack Advertiser of 1916. 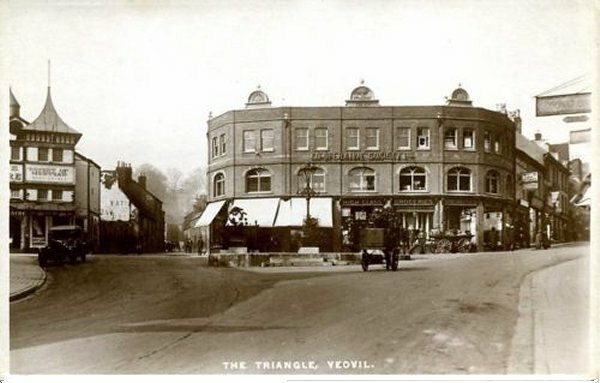 A postcard of the Triangle about 1920, before the construction of the underground toilets. 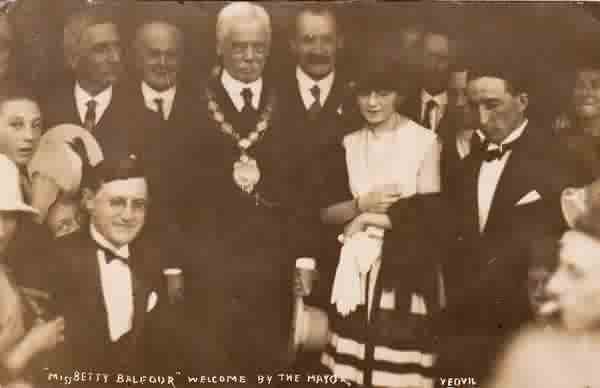 On Tuesday evening 11 August 1926 Betty Balfour (1903-1977), a big star of the British silent cinema, appeared both on the screen in Sqibbs wins the Calcutta Cup and in person on the stage of the Yeovil Palace Theatre. 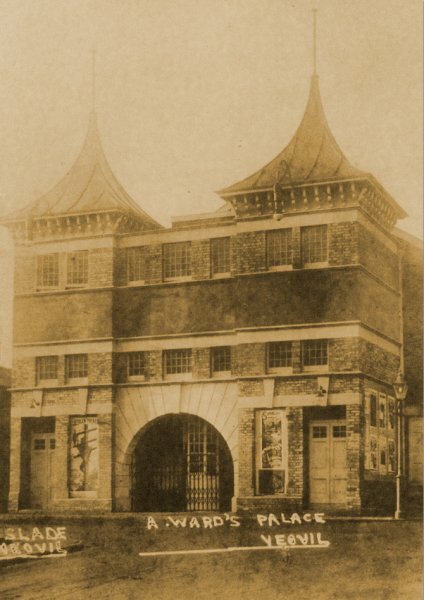 The entrance to the theatre off the Triangle, was packed with fans anxious to catch a glimpse of the diminutive star as she was welcomed by the Mayor, Alderman Jabez Matthews, wearing his chain of office, and accompanied by fellow aldermen and councillors whilst the Town Band played ‘Rule Britannia’. During the interval in the show, Betty Balfour a spoke to the audience, expressing her delight at being with them and sharing the excitement of the film. Following the entertainment, the mayor and town councillors, were her guests at a ‘social evening’ in the Mermaid Hotel. The Western Gazette reported that Betty Balfour was working on location for a film called Somebody’s Darling at Martock, Compton Pauncefoot and Minehead, which the producers stated provided rural settings which were ‘something the Americans could not get’. A detail from a 1927 postcard showing the Palace Theatre. The Palace Theatre, photographed in 1927. 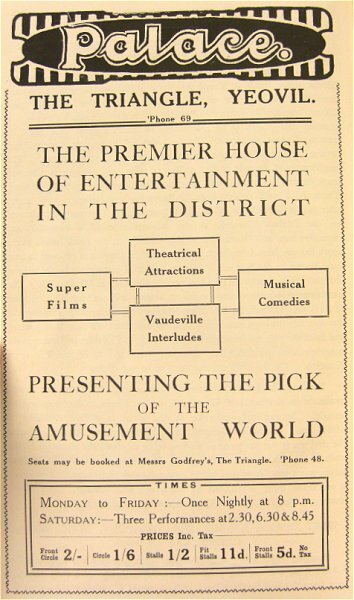 Both sides of a Palace Theatre programme of 1930. An advertisement placed in the 10 October 1930 edition of the Western Gazette. 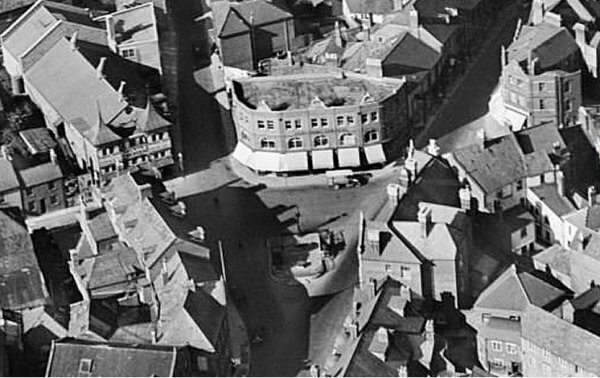 An aerial view of the Triangle dating to 1928 with the Co-operative Society's building and underground toilets in the centre - possibly under construction at this time? 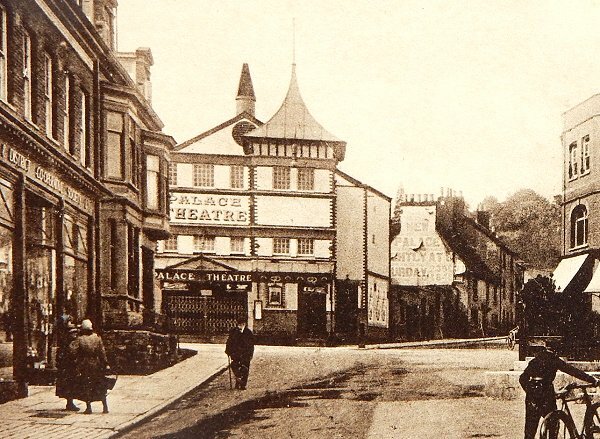 Note the old Palace Theatre at top left, on the corner of South Street and Stars Lane. 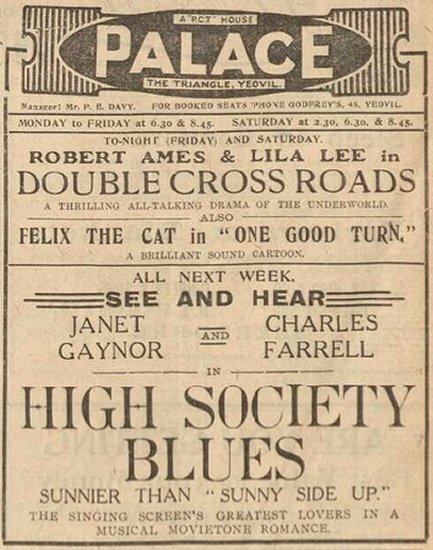 A 1920's advertisement for the Palace Theatre from the Warbis Magazine, by this time simply known as the Palace. The prices of admission are interesting - from 2/- in the Frost Circle to 5d (with no tax!) in the front stalls. A postcard of about 1930 with the completed toilets in front of the Co-op building with the Palace Theatre seen at extreme left.